On November 19th Catholic Charities in Terre Haute hosted Harvest of Hope to formally announce our $1.5 million basic need campaign entitled, “Closing the Meal Gap.” This event was the inspiration of chefs Jordan Bayles and Kris Kraut with Sodexo at ISU as part of an effort to promote locally grown food. Several local talents also participated in this effort including: Brenda Weber, Roberta Weliever, Martha Tempel, Mary Chloupek, Teddy Lenderman, members of the Terre Haute North High School Key Club, and the ISU Women’s Soccer Team along with Coach Erica True. Entertainment was provided by The Lemon Brother’s Band. 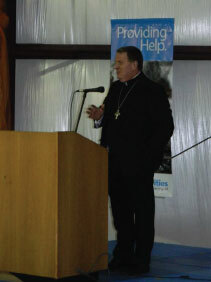 Attending and serving as our featured guest speaker was the Most Reverend Archbishop Joseph W. Tobin, C.S.s.R. who spoke on the local hunger needs in west central Indiana and reminded us of what our response means to our brothers and sisters during a time of great struggle. 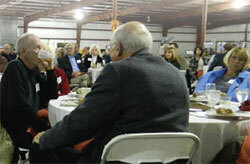 Special guests attending the event included Attorney General Gregory Zoeller and Mayor Duke Bennett. Archbishop Tobin spoke about “Freedom from Want,” the famous Norman Rockwell painting that depicts the stereotypical Thanksgiving meal being celebrated in what many would consider the classic America fashion. While ubiquitous, the painting never fails to hold people's interest, brings minor awe at its structure and draws out at least some kind of emotion – even to those in other countries who understand the concept. More recently, the strongest emotion it might render is a desire for a familial ideal that many people unfortunately cannot attain in their own lives. In fact, Rockwell's ideal may have already been dreamed of even in 1943 when it was first painted, despite family units having at least slightly better cohesion in those days. Rockwell’s inspiration came from President Franklin Delano Roosevelt’s famous January 1941 speech to Congress outlining his vision of “Four Freedoms” – Freedom of Speech, Freedom of Religion, Freedom from Want, and Freedom from Fear. The mission of the Foodbank is to feed the hungry so our neighbors can realize President Roosevelt’s vision of a country which is free of want. The goal of our campaign will help us continue to meet our mission by raising funds for the creation of a new foodbank facility. Quite simply, our agency spent more than seven years researching and investigating what we do at our current location and studying the current hunger situation in the seven west central Indiana counties we serve. While food is currently provided to more than 32,000 people each year, there are still many more we believe we can reach upon securing a more adequate facility. More than 60% of our $2.5 million goal has been raised (which includes $1.5 million for the building and property and $1 million to create an endowment to defray the increased cost of operations). We hope you will join us in the vision to create a community that is free from hunger and the want – no, rather the need – for food. Forty-one years ago, in the spring of 1973, my father along with Father Don Schmidlin were well aware of the hardships in this community, with many companies moving out or going out of business and taking good paying jobs with them. A shift was occurring and many families were getting caught in the shuffle. Their response, along with several others in this community, was to create this agency, Catholic Charities, to provide basic needs to people regardless of age, race, creed or religious affiliation. While we still do these things today, the need is greater. Today more than 13,000 children in our seven counties struggle with access to an adequate amount of safe, nutritious food. 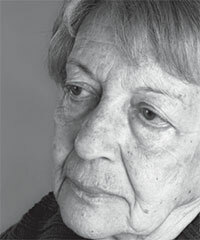 Almost 11,000 senior citizens have the same challenge. Collectively more than 1 in 6 people and 1 in 4 children are food insecure. As a community, I believe we can do better than to allow this serious struggle to continue. We can solve hunger for those who are food insecure in our communities by acting on the belief that freedom from want is possible if we simply meet the most basic of needs. Won’t you join us? 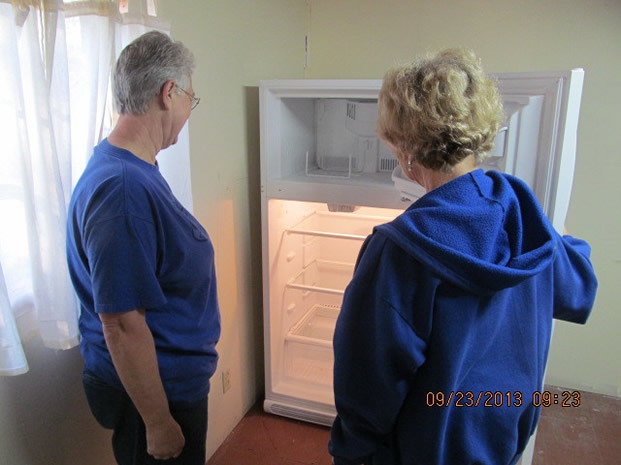 Recently, we conducted our third annual refrigeration grant opportunity to award a refrigerator or freezer to a member agency expressing their need and the benefits for one of these units. After much consideration, our Advisory Council awarded Mecca New Life Church in Mecca, IN and New Life Fellowship in Terre Haute, IN as the recipients of this year's grant. While Mecca is expanding their food services and New Life is hosting a new food pantry, both member agencies are very active in their communities and have been serving the hungry in various capacities throughout the years. As with all of our member agencies, produce and frozen meats provide an essential balance of nutrition for their clients. Having ample means of refrigeration to store these products is a challenge for most of our pantries as they strive to meet the needs of those in need with what is available. With the additional refrigeration capacity, our agencies can provide items that families may not otherwise have access to because of affordability or availability. The staff and volunteers at these food pantries see the hungry faces and strive to do all they can to help ease the burden. Whether providing buddy packs to the children, a cold drink to a thirsty individual, a healthy assortment of foods for a family, or a nutritious cooked meal for a hungry belly, these pantries are anxious to serve their community. Every week when agency staff or volunteers come to the Foodbank for an assortment of food, we hear heartwarming stories of how the meals provided have touched someone's life and how grateful the recipients are for their groceries. During the hot summer months, these agencies are especially thankful for the ability to provide cool, refreshing, and appetizing food because of this grant award. We thank them for what they are doing, and know that because of their efforts, there are families who will sleep at night with a full stomach. Collaborations between Catholic Charities Foodbank and Families By Choice continue to expand. Some of you may recall the story of Bernie Ryan, the “bread” man, who picks up and delivers Panera Bread. He still does…and now his wife Muriel is delivering food to Garfield Towers and Gardens, as well. Families By Choice serves persons who lack the basics of food and shelter and are at a distance from their family – either emotionally or geographically. A project with the Garfield Towers and Gardens public housing projects helped Families By Choice (FBC) see the shortage of food many of their residents have. In February 2012, when Public Housing contacted the Foodbank, we called on Families by Choice to organize and develop a system to supply the hungriest of the hungry that are disabled, elderly and/or have no transportation. As a result, Operation Cooperation to Feed was created. After a lengthy process of securing the funds, FBC and their volunteers now pack boxes once a month on the tables at Ryves Youth Center and deliver them to an ever-growing group of persons in need at Garfield Towers and Gardens. If you would like to help with this outreach, please send gas cards or call 812-230-4401 and FBC will supply further details. You can also visit FBC online for more information at familiesbychoice.org or connect with them on Facebook at Families By Choice. Lisa Summers, Food Sourcer for Terre Haute Catholic Charities Foodbank, spearheaded this year’s Hunger Study to learn more about the individuals who receive food through the Foodbank and its member agencies. 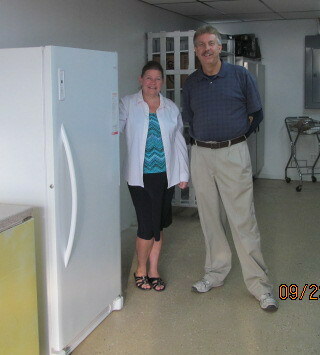 On a recent pantry visit, Lisa met Rita and her sister. Stories like these are always difficult to hear – and it is a blessing to know that Terre Haute Catholic Charities Foodbank can help Rita and others like her during these difficult times. For the second year, VNA Hospice of the Wabash Valley collaborated with Terre Haute Catholic Charities Foodbank to lead an effort to raise awareness of the hunger issues in our communities and raise funds to help alleviate the issue. The group enlisted volunteers to help sell orange ribbons leading up to and on Friday, November 22, 2013. The $3 contribution received per orange ribbon allowed the Foodbank to provide enough food to feed a family of four for an entire day. This year, as an incentive to exceed last year’s donations, John Etling, agency director of Catholic Charities Terre Haute, agreed to have his hair dyed orange if the Visiting Nurses Association and Hospice of the Wabash Valley raised $5,000 on Orange Friday. The organizations raised $5,158.69! That was enough to provide an additional 20,600 meals. John, along with several media partners, spent an afternoon at Tru Colour Studio with Angie Decker to keep his part of the agreement. 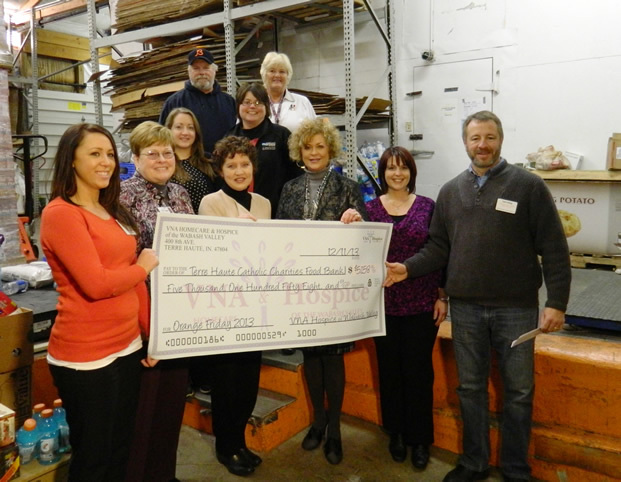 We are looking forward to working together with VNA Hospice of the Wabash Valley again in 2014 as we continue to raise awareness about hunger in our communities and raise funding to provide meals to those most in need. If you are interested in joining us, please contact Jennifer at (812)232-1447.